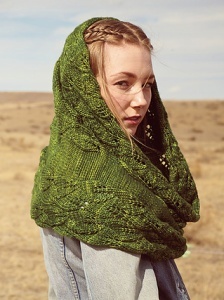 Taken from Knitscene Accessories 2013: Eloen is a generous cowl with beautiful leaf detailing that can also be worn as a hood! Size US 9-24" circular needle (or size needed to obtain gauge), stitch markers, and a tapestry needle are required but not included. Finished Measurements: 40" circ. x 20" wide after blocking. Gauge: 18 sts and 24 rows over 4"